For sellers, success is all about managing the offers, while buyers must strategize and be prepared to compete. In a market with limited inventory and lots of willing and able buyers, we find a hot sellers’ market. Phrases such as “bidding wars” and “non-contingent offers” are music to sellers’ ears — and enough to scare a buyer into renting for another year. 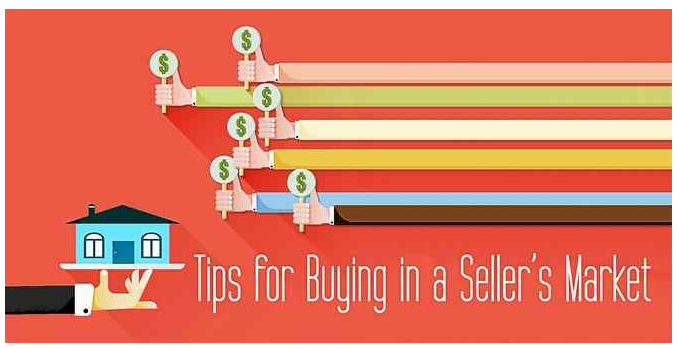 Here are some tips to make the most of a sale or purchase in a sellers’ market. Just because it’s a sellers’ market doesn’t mean that the traditional real estate rules get thrown out the door. Sellers still must put their best foot forward in order to get top dollar and complete a timely sale. The well-priced homes that show in their best condition will sell instantly in a sellers’ market. If you price your home higher than the comparable sales or you don’t put in the right effort to make the house show well, you may not get the most money for it. What makes a sellers’ market so strong is attracting multiple buyers at once. Buyers will always flock to the well-priced homes that show well — period. If you have the luxury of multiple buyers making offers, choose the best buyer right out of the gate. How can you tell who that is? The best buyer is the one who is most experienced in the market, is working with a local agent, has their loan lined up, and makes the most aggressive offer, soon after you list. Often they are the first buyer in the door. Also get a backup offer (or two) lined up and in writing when you accept the first offer. The last thing you want is to have to go back on the market. It signals that there could be something wrong with your home. And once you’ve lost that initial momentum, it’s hard to recoup it when you go back on the market. There is nothing more frustrating than being a buyer in a sellers’ market. A buyer who wants to purchase, has their financing lined up, and has done their research may be unable to do so. This is frustrating, and there is little they can do but wait for inventory and have their ducks in a row. The early bird approach works in real estate. Once a good listing hits the market, the interested buyer should see it instantly. If it comes on the market on a Wednesday, don’t wait for the open house. A more aggressive buyer will see it Thursday morning and make an offer within hours. Come Sunday you will be disappointed. Buying a home requires lots of time and energy. You need a good agent on your side and a serious investment in time to watch the market and see homes quickly. If you like a home, move fast with an offer, and make it a strong one — not just in price, but also in terms. Knowing that you may face other buyers, find out what is important to the seller. Maybe they want a quick close, or they need time to find a home. Structure your offer to meet their needs. The first buyer is nearly always the best buyer. By moving quickly, these buyers show sellers they mean business. If you want to submit an offer, make your contingencies and timeframes swift, and take as much risk as possible off the table for the seller. If you need to inspect the property and have an appraisal, get those done within days of getting into contract, not weeks. If you are aggressive, have the home inspected prior to submitting the offer. Inspections pose the biggest risk or uncertainty in the eyes of the seller. If you inspect before you make the offer, you can make your offer not contingent on inspections. Loans take longer today than they did 10 years ago. When obtaining financing, work closely with your mortgage professional well in advance. Submit a full file and understand what is needed. The more complete your file, the quicker the loan will close. If you need to ask the seller for a month for a financing contingency, you won’t be able to compete with someone who can do it in half the time, simply because they planned better. Part of what makes a buyer successful in a sellers’ market is being aware from the outset what they are in for, and then planning accordingly. If you find yourself being beat out by other buyers or too late to the game, you simply may not be ready to buy. Think long and hard about your personal and financial situation, and take a step back if you aren’t prepared to compete.